Digital signage developer CAYIN Technology rolls out Failover Solutions (Redundancy) for server backup. CAYIN's Redundancy program has great benefits to a stable digital signage playback environment. Backing up a server has great benefits to a stable playback environment when it comes to digital signage. CAYIN Technology has recently released its long-asked-for server Redundancy program, otherwise known as Failover Solutions. The feature is available on all across the version 9.0 CMS servers. To enable the Redundancy feature, users can purchase 2 identical servers, or simply add a second server (of the same model and firmware version) to an existing network. The second unit will act as a 24/7 safety net should anything happens to the main server. If an outage occurs on the main server, the backup server will automatically take over the connection, and vise versa. The redundancy status can be easily monitored from both the backup and major server dashboard. CAYIN’s Redundancy is essentially a backup process for preventing data loss and service outage. Redundancy service provides a more secured playback environment for the SMP players managed by a CMS server, by constantly syncing all the settings and contents into a backup CMS server. 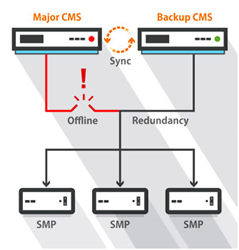 Whenever a Major CMS is offline, or unable to connect to its SMP players, the backup server will automatically divert the connection until the Major CMS becomes available again.